I have anxiously been awaiting the next book from Dani Pettrey since she ended her last series. 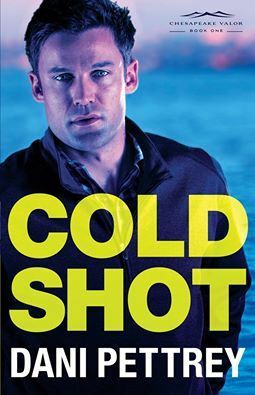 Cold Shot opens up with a new cast of characters in an all new setting, and I was so excited to have it in my hands. Here’s the blurb, and we’ll chat on the other side. From page one, Cold Shot brings you straight into the suspense. I truly enjoy that aspect. And the first meeting between Griffin and Finley suited them perfectly and set up what promised to be a dynamic relationship coming together. Instead, this became a portion of the book that left me wanting more. While Pettrey does an amazing job with a complex plot that definitely keeps you sucked in for the suspense aspect of this book, I found the romance side slighted compared to what I know she typically writes. Cold Shot feels like a large set-up for this new series with many (if not all) of the new characters coming on screen inside the pages of book one. And while I thoroughly enjoyed getting to know them all and am intrigued to solve their mysteries, too many of the pages focused on their introductions, making Griffin and Finley’s relationship take a back seat. That being said, Griffin and Finley are still the main couple of Cold Shot and they do receive their HEA by book’s end, I only wish more pages had been dedicated to them getting there, because they are two amazing characters who would have benefitted from more screen time. Still, Pettrey knows how to write a suspense that borderlines a mystery and she does craft some pretty amazing characters who will easily carry this new series. And though Griffin and Finley’s story is completely wrapped up at the end of Cold Shot, there’s enough overarching mystery in these friends’ lives to keep you coming back for the next book, which I most definitely will be doing. I happily give Cold Shot 4 out of 5 stars and you can purchase it here. Thanks for sharing about this story. Mary Higgins Clark writes stories that are more focused on the suspense and lighter on the romance, and that's what your review makes me think of. The method had seriously worked for her, and it sounds like it's working for Dani in this story. I always enjoy stopping by to see what you're reading! Have a great weekend!